(Calgary) The City of Calgary, now has a new partner in crime. The Attorney General of Alberta has stepped in with their friends at City Hall, in this fight against personal liberties and freedoms, in their attempt to slap an injunction against Street Church's work, taking care of the poor. In this latest tactic to leave the homeless in the cold, the case has become even more sinister, with the bigger guns of higher government stepping in to attempt to crush Street Church. "This concerted malicious attack on freedom, reminds me of the events of the nineteen thirties, when the Nazis were in power in Germany. I have studied these historical events extensively, I have personally visited Auschwitz and Birkenau, and I am seeing incredible parallels between the attempts to strip the rights of Christians and the systematic stripping of the rights, and eventually personhood altogether, of their fellow Jewish citizens initially in Germany, and ultimately in all of Europe. In Street Church we have members who were fighting in the war against the Nazis for six years, for what are now called guaranteed fundamental freedoms. How ironic that those same volunteers who fought for those human rights are facing potential jail time for exercising their rights in the work and ministry of feeding the poor. ", said Artur Pawlowski, Spokesman for Street Church Evangelistic Ministries. Street Church Ministries is amazed at the fury and force that the government is employing to shut down efforts to take care of the poor. Street Church warns that attacks on freedoms across our Country will only increase if the City wins this injunction. 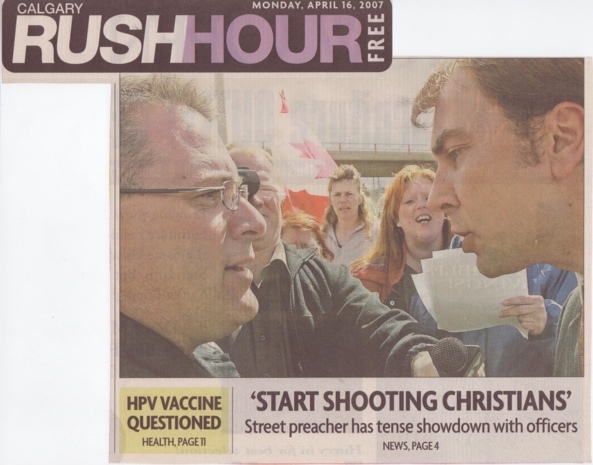 Street Church is calling all Canadians that value freedom and personal liberty to step forward and speak out against this spreading oppression. "This battle is not just a battle for the rights of Street Church members, not just a battle for the rights of the poor, and our present generation, but is a battle that will effect many generations to come. The time to act, is now, the time to stand, is now, the time to speak, is now, while there is yet the ability to freely rise up against oppression. In the words of Dietrich Bonhoeffer (a Christian pastor in Nazis Germany who in his stand paid the ultimate price – shot and killed for speaking out), 'There are things for which an uncompromising stand is worth while.'" Street Church asks all who believe in freedom and personal liberty to join them at the new Calgary Courts Centre, 601 – 5th Street SW, at 9:15 AM on Thursday, April 17. "We will have a time of prayer and will sing the National Anthem. All who come can see copies of all of the tickets that have been issued to Street Church Ministries for taking care of the poor", Concluded Artur. Artur Pawlowski and Street Church Ministries is holding a press conference about this precedent setting case, at the steps of the Calgary Courts Centre at 9:30 AM April 17.